While I am accustomed to staying home with my kids by myself, I am still always a little nervous when we add the new one. I mean, can I really take care of a newborn with other children in the house? What if something goes wrong? I really don’t know if I am ready for this. But it doesn’t matter. My husband needs to go to work, so I need to put on my big girl pants and realize that I can handle it. Or we will just watch a lot of Netflix. Yes, that is a good plan. So I’m worried about being home alone with 7 kids for the first time and I also decide to potty-train a three-year-old. Clearly, I think I’m supermom. Within the first 3 hours of my first day alone with the kids, I had a said 3-year-old pee all over the bathroom floor. I guess we will just hold off on the potty training thing a bit. Most of my week ended up being Netflix and PBS (hey that should count as school!) in the morning to survive until nap time. Two would go down for naptime and then the older children had game time. There was some school thrown in there on occasion, but really it’s just survival mode here these first couple weeks. 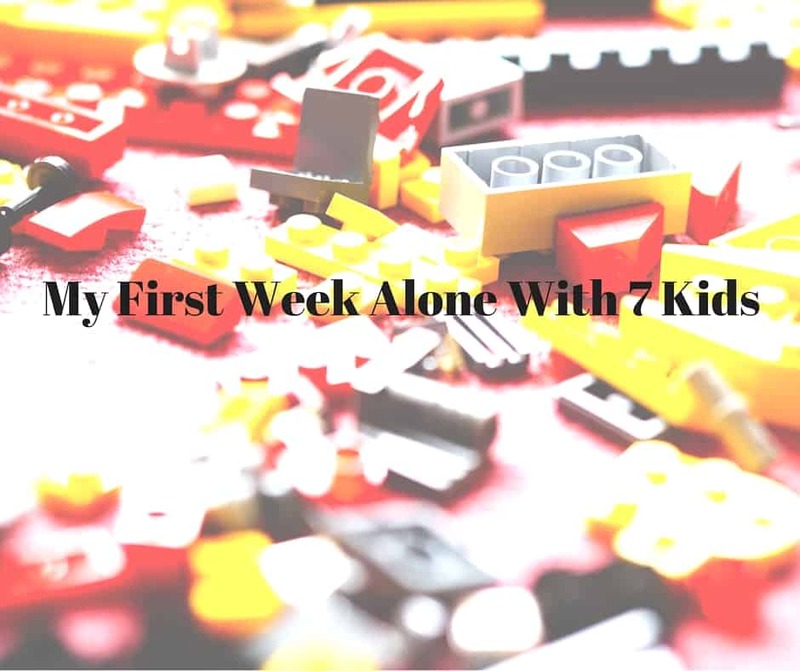 It doesn’t matter if it’s one child, three, five, or ten, when you spend those first couple days by yourself with your kids, you feel amazing! You deserve a medal! I’ve got to be honest I can’t even remember how I handled a new baby without Netflix. Really the week was mostly uneventful. I had low expectations, which meant if I showered I was ahead of the game. I’m still trying to remember how I use to take showers every day. It also may have gone well because I’ve been on a sugar high from all the desserts we have received when people bring us meals. Right now I am in that glorious period of nursing where I can pretty much eat whatever I want without having to worry about weight gain and let me tell you, it is good. Unfortunately, the baby caught the cold that was going around our house on Friday, which wasn’t a huge shocker. I feel like every baby we have brought home always somehow catches a cold. And that gets frustrating. What newborn doesn’t love getting their nose sucked out all the time? And of course, laying down flat is out of the question (although let’s be honest I love holding the baby all the time, even when sleeping). But we made it! Hopefully, things will only go up from here as we start to figure out our routine with a new baby. My next test will be leaving the house with all the kids by myself (Good thing it is winter and there is nowhere to go yet! ).